On Saturday the 14th may we were at the Health Minister ela in Carlisle City Centre and helped out our friends at MY WAY CODE . On March 7th members Amanda and Chris participated, in a tree plant. On January 30th nearly every member helped Carlisle Youth Council, by attending Carlisle Skills Fair. We had our own stall and we successfully promoted and represented. Well done everyone! On The 19th December 2013, we held our very 1st annual AGM meeting. It was a tremendously successful night. A huge thank you to everyone involved, and to everyone who has made this possible over the years! 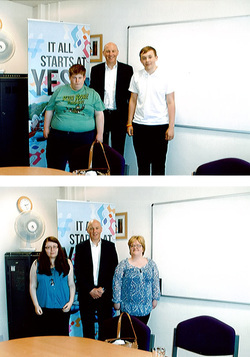 Carlisle Youth Council Gathered Votes for the Make Your Mark Campaign. On the 9th September 2013 members Chris Barry and Tony Park, went to Carlisle College to gather votes for the Make your Mark campaign. It was very sucessful as they contributed, to the 3700 votes gathered in Cumbria. Well done to them! 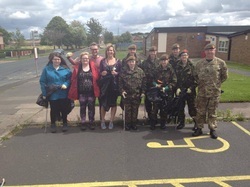 Carlisle Youth Council Members Helped With a Litter Pick. 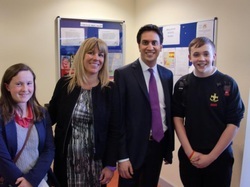 The chair of Carlisle Youth Council Simon Boothroyd quoted " I think that was interesting to meet Ed Milliband and to hear his thoughts compared to ours as Youth Council". 1.) We asked if it would it be possible to send us an invite to visit you in London? A:John said he would send an invite to the group. 2.) The second question was Where he stood on PHSCE (personal, health,social,citizenship,education) being reintroduced into secondary school curriculum. A: At first John didn't know, after a proper explanation he agreed that it would be a good idea. 3.) We asked him what was the most important issue affecting Carlisle young people. A: He said jobs,skills and that people should have access to higher education if they want like Universities and Aprenticeships. 4. Finally we asked if we could contact him again for his support. A: He said we can get in contact with him and he will help anyway he can.